Alabama came out firing on all cylinders to start the game quickly getting up 27-0, but would quickly let of the gas and went on to win 34-20 over Tennessee. It started with a 80 yard touchdown pass from Blake Sims to Amari Cooper (the video of it is below) on Alabama first offensive play. The Crimson Tide would score again on a 41 yard pass to Cooper, who had 185 yards receiving in the first quarter. Cooper broke Alabama single game record for receiving yards in a game, with 224 yards. The previous record holder was Julio Jones with 221 against Tennessee in 2010. Cooper also tied DJ Hall for the most career 100 yard games at 13. Cooper will more than likely go down as the greatest receiver in Alabama history. Tennessee had no answers early, but on the third drive coach Butch Jones decided to put Joshua Dobbs in and he never looked back. Nathan Peterman made the start for the Vols, but never got the offense moving. I’ve been saying this whole season that I think Dobbs is Tennessee best option at quarterback. Dobbs put Tennessee back into this game, he finished with 192 yards passing on 19 completions and two touchdowns. He led the team in rushing with 75 yards. He made some big plays that keep them in the game and I think if he plays against Florida a few weeks back, the Vols win the game. Eight different players caught passes for the Vols, with Marquez North leading the team with 56 yards on four receptions. Freshman running back Jalen Hurd had a decent game, rushing for 59 and he also had 27 yards receiving. The Tennessee defense lived up to the hype for three of the four quarters and they really impressed me. Their defense should return eight starters next season, which is very scary for the rest of the SEC. Tennessee falls to 3-5 and 0-4 in the SEC, the Vols are two losses away from being eliminated from a bowl game. I think they have a shot in the rest of their games. They play at South Carolina, at home against Kentucky, at Missouri, and they finish out the season at Vanderbilt. Alabama improved to 7-1 and 4-1 in the SEC. The Crimson Tide got great news at the end of the game, with Ole Miss going down to LSU. Alabama will have to win out, and Ole Miss will have to lose one more SEC game for Alabama to play in the SEC title game. Senior quarterback Blake Sims had another big game, mostly connecting to Cooper. Sims threw for 286 yards on 14 completions and two touchdowns. Sims also ran for 42 yards and a touchdown. Sims now has a QBR of 95.9, which is second in the nation behind Dak Prescott of Mississippi State. Derrick Henry rushed for 78 yards on 16 carries and a touchdown, including a 28 yard touchdown run in the third quarter that halted the Vols momentum. Henry hasn’t looked as explosive this season, as he did in the Sugar Bowl last season. Junior running back T.J. Yeldon ran for 52 yards on 14 carries and scored a touchdown. Cornerback Cyrus Jones came up with an interception in the fourth quarter for the Tide. Lane Kiffin making his return to Knoxville seemed like the biggest story of the week and he silenced the crowd quickly, after Cooper’s big play to start the game. I thought this game would be a blowout and it looked that way early, but Tennessee didn’t give up and they keep fighting back. The Vols proved a lot of people wrong and stayed in the game. Alabama is off next week, but will travel to LSU on November 8th. The Crimson Tide will have a very difficult November, with games at LSU, at home against Mississippi State and Auburn. 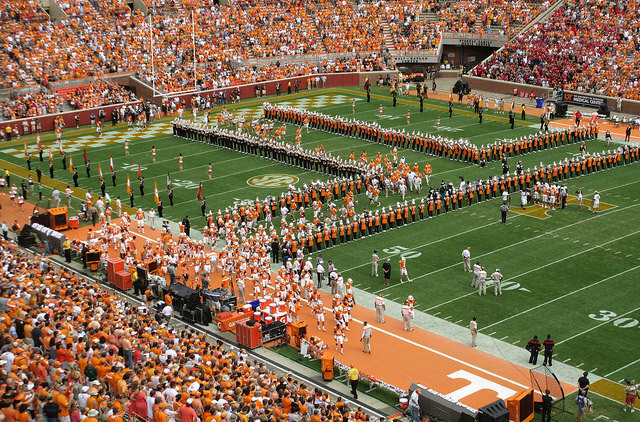 Tennessee travels to South Carolina next week. The Gamecocks are 4-4 and this could be a game for Dobbs and Tennessee to make a statement.